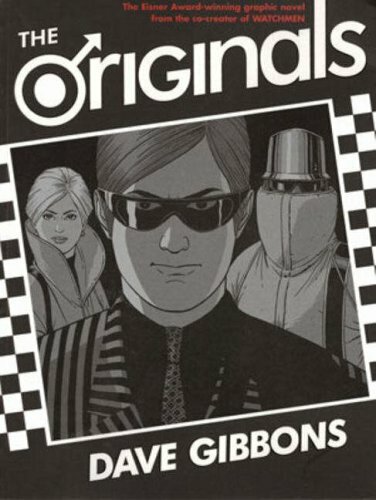 Dave Gibbons’ THE ORIGINALS is a very smart production, an unusual squarish hardback with striking black and white op art styling; and the content isn’t terrible, not by a long shot, but there’s nothing about it you haven’t seen before. Visually, it’s WATCHMEN meets QUADROPHENIA: that O-with-an-arrow Original logo says it all. Take a bunch of mods, jazz them up with Bridget Riley monochrome geometrical designs, then add a futuristic twist: the scooters that are not exactly scooters, the parkas that aren’t exactly parkas. This feels like cheating: the story draws authenticity and colour from clear and specific references to time and place, and then demands the right to tell it like it wasn’t on the basis of a few cosmetic changes. Throwing in some WATCHMEN-style graffiti just reminds us how well this can be done, and how well Gibbons can do it. The protagonist (and while of course the characters all had names, I returned the book to the library before I wrote this: draw your own conclusions from my inability to remember those names) is a bit of a blank, character-wise. To some extent, the construction of the story requires this: the reader has to be able to sympathise with the character enough that it’s a shock when he finally throws in his lot with the bad guys, when he sees his progression not as tragic but as a price worth paying. You sympathise with the protagonist because you expect to sympathise with him; besides, he has a Best Friend and a Girl who seem like nice people, and they both like him – though in retrospect, it’s hard to see why. The other thing I don’t know is why he so dislikes the other kid, the one who idolises him the way he idolises the Originals. It turns out, of course, that this is the loose cannon, the wild card, the person who gets a gun and shifts the violence up a notch, so that afterwards he can justify his dislike – as if this wildness was something he’d naturally dislike, as if it weren’t something he’d helped to create by always pushing the boy out of the group. It feels as if there’s a back-story here, but it hasn’t been supplied. To be fair to Dave Gibbons, he nearly gets away with this – THE ORIGINALS isn’t the worst comic I read all year. I didn’t see the final twist coming, for example, but when it did I thought “Oh, of course!” and was irritated with myself for not anticipating it. I’d probably be less irritated by the book, too, if it felt like more of a total failure, less of a missed opportunity.